Summary: The ARVA Neo+ is a three-antenna avalanche transceiver that supports the marking of multiple burials. Although it is one of the larger and heavier avalanche transceivers, it is easy to use and moderately priced. The Neo+ has a motion sensor which prevents the transceiver from reverting from searching to transmitting if it senses motion. The Neo+ is turned on and off by twisting a dial, rather than inserting and twisting a "plug" that is attached to the transceiver's leash. The Neo+ has a recommended search strip width of 70 meters versus the Neo's 60 meters. The Neo+ has a rigid holster-style harness versus the Neo's neoprene pouch. The Neo+ is ~18% heavier than the Neo. The difference in weight is due to the new harness. On both the Neo and the Neo+, you toggle between Search and Send mode using a sliding switch. On the two (brand new) Neo+ transceivers I tested, however, it is extremely easy to slide this switch (whereas the switch on the Neo was stiff). This makes it more likely you will inadvertently change from Searching to Sending. Searching: The Neo+ has a suggested search strip width of 70 meters. The only other transceivers that suggest 70+ meters are Mammut's Barryvox and Barryvox S. I have not tested the Neo+'s reception range, but generally speaking, most manufactures suggest an unrealistically wide search strip. Most avalanche instructors recommend a search strip of 30 or 40 meters (I usually recommend 30 meters). On the non-plus version of the Neo, I occasionally received a signal at extreme ranges when the transceiver didn't appear to have a strong enough signal to accurately point the directional indicator (i.e., it would point the wrong direction). I don't know if this is the case with the Neo+, but I would suggest narrower search strips (e.g., 40 meters) and that you continue your signal search until the displayed distance is less than 50 meters. If you are moving away from the transmitter (which is reasonable due to the way flux lines propagate), the Neo+ will display a "back arrow" (similar to how many other transceivers display a U-turn indicator) instructing you turn around. The Neo+ displays an LCD direction arrow which can be set to disappear at either 3 or 5 meters to facilitate the fine search (I'd leave it set to 3 meters). Spikes: In my minimal testing of the Neo+'s spike handling, it was solid. In a few orientations it wasn't perfect, but it was still good. Multiple Burials: The Neo+ shows up to three silhouettes on the display to indicate the number of transmitters. A plus sign appears when there are more than three transmitters. When you are within 3 or 5 meters (a custom setting) of a transmitting beacon, a "flag" icon blinks in the upper right-hand corner of the display to let you know that you can "suppress" (aka, "mark" or "flag") that transmitter. Pressing and releasing the intuitively labeled Flag button will ignore the closest beacon and direct you to the next transmitter. An equally intuitive flag icon will then appear next to one of the silhouettes. If you attempt to flag a transmitter when you are too far away, the word "no" is displayed on the screen. To unflag the previously ignored transmitters, toggle the Neo+ to Send and back to Search. Although I have done minimal testing of the Neo+'s flag command, the transceiver's use of a consistent image (i.e., a flag) when you are within range, on the button, and next to the flagged silhouettes is very intuitive. Controls: The Neo+'s controls are easy to use. The power is turned on by twisting a dial-like switch. A mitten-friendly "sliding" switch changes the transceiver between Send and Search. A single "Flag" button is in the center of the device. As mentioned above, I am concerned that the sliding switch on the Neo+ is so easy to slide that it will be easy to inadvertently change from searching to transmitting. BCA encountered a similar problem on the Tracker2 and if you send a Tracker2 to BCA to have the version 4 software installed, they will modify the sliding switch so it requires more force to change from Search to Send. And unlike the Mammut and Tracker transceivers, the Neos do not provide an audible indication when you change between Searching and Sending. 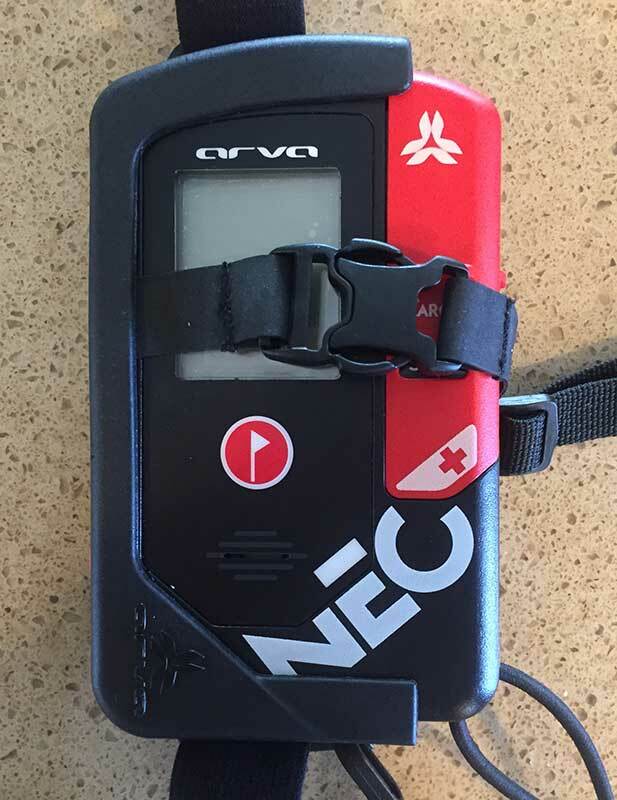 The Neo+ (and the Neo) is one of the few avalanche transceivers that does not have a blinking light that shows that it is transmitting (and which should visible when in its harness). It's worth noting that the Neo+'s speaker is loud. Really loud. Aging patrollers who have spent years playing with avalanche explosives will appreciate this. Group Check: During startup, the Neo+ displays its firmware version, the battery percentage, and then "CH" (for CHeck) for several seconds. Pressing the Flag button while CH is displayed enters the Neo+'s group check mode. While in group check mode, the Neo+ beeps if a transmitter is between 0.5 and 1.5 meters. If you get further than 1.5 meters, it stops beeping. If you get closer than 0.5 meters, it beeps loudly. You exit the group check mode by pressing the Flag button. None of this is intuitive, but it is learnable if you use this feature frequently. Optionally, you could use the normal search mode to do a simple partner check. You can disable the prompt for the group check (i.e., the "CH") using a custom setting. Revert to Transmit: The Neo+ can be programmed to automatically switch from search mode to transmit mode if 2, 4, or 8 minutes pass without significant motion. Auto-reverting is helpful in the extremely unlikely case that you are buried by a second avalanche while searching. The downside of auto-reverting is if a second avalanche occurs while you are searching, it's likely your transceiver will be torn from your hands and your buddies will waste time digging up an unattached yet now-transmitting transceiver. The Neo+ bases the decision to revert to transmitting on whether motion is detected. As long as you are moving (i.e., searching), it will remain in search mode. If you are buried by a secondary avalanche (and hence, no longer moving), the Neo+ will wait the specified number of minutes and then revert to transmitting. Comfort: The Neo+ has a rigid holster-style harness with a glove-friendly Fastex closure. The holster is designed so you can pull the strap (after releasing the Fastex buckle) to quickly extract the transceiver. The new harness also allows the transceiver to be stored while still in search mode (which might be appropriate when shoveling). The holster is designed so the Neo+'s screen always faces outwards—most manufactures instruct you to position the transceiver so its screen is toward your body to protect it from impact damage. ARVA tells me that the Neo+ has a protective cover over the screen that will prevent the screen from being damaged. 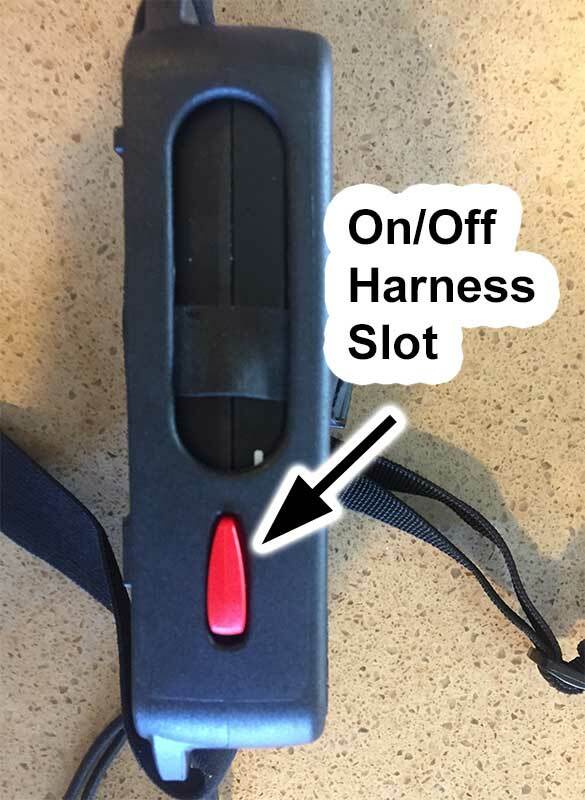 Somewhat unusually, you can't insert the transceiver all the way into its harness when the transceiver is turned off (a slot in the plastic holster requires that the on/off switch is in the "On" position, see photo). That might be a good safety feature (i.e., you probably shouldn't be wearing the transceiver when it is turned off), but it makes the already large transceiver protrude from its holster. When worn with its harness, the Neo+ is approximately 25% heavier than other popular beacons (e.g., BCA Tracker3, Mammut Barryvox, and Pieps Sport). Even more noticeable than its weight, the Neo+ is approximately 45% larger than the Tracker3, 35% larger than the Barryvox, and 15% larger than the Pieps Sport. Considering that we spend significantly more time wearing avalanche transceivers than we do handling them, I personally find the Neo+ uncomfortably large and bulky. Updates: The ARVA Neo+ supports software updates. Read the details here. Custom Settings: Custom options within the Neo+ allow you to specify the number of minutes before the Neo+ will revert to transmit (specify 0 to disable this feature), the maximum distance where you can flag a transceiver during a multiple burial (either 3 or 5 meters), and whether you want to enable or disable the group check mode on startup ("1" enables and "0" disables). Learn how to configure these custom settings.